para rubber, the tree Hevea brasiliensis, are usually called plantations. Oil Palm Oil palm agriculture is rapidly expanding across wet tropical regions, and is usually developed at plantation scale. Orchards Fruit orchards are sometimes considered to be plantations. 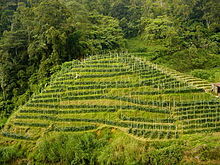 Arable crops These include tobacco, sugarcane, pineapple, and cotton, especially in historical usage. Before the rise of cotton in the American South, indigo and rice were also sometimes called plantation crops. Fishing plantations in Newfoundland and Labrador When Newfoundland was colonized by England in 1610, the original colonists were called "Planters" and their fishing rooms were known as "fishing plantations". These terms were used well into the 20th century. The following three plantations are maintained by the Government of Newfoundland and Labrador as provincial heritage sites: Sea-Forest Plantation was a 17th-century fishing plantation established at Cuper's Cove (present-day Cupids) under a royal charter issued by King James I. Mockbeggar Plantation is an 18th-century fishing plantation at Bonavista. Pool Plantation a 17th-century fishing plantation maintained by Sir David Kirke and his heirs at Ferryland. The plantation was destroyed by French invaders in 1696. Other fishing plantations: Bristol's Hope Plantation, a 17th-century fishing plantation established at Harbour Grace, created by the Bristol Society of Merchant-Adventurers. Benger Plantation, an 18th-century fishing plantation maintained by James Benger and his heirs at Ferryland. It was built on the site of Georgia plantation. Piggeon's Plantation, an 18th-century fishing plantation maintained by Ellias Piggeon at Ferryland.